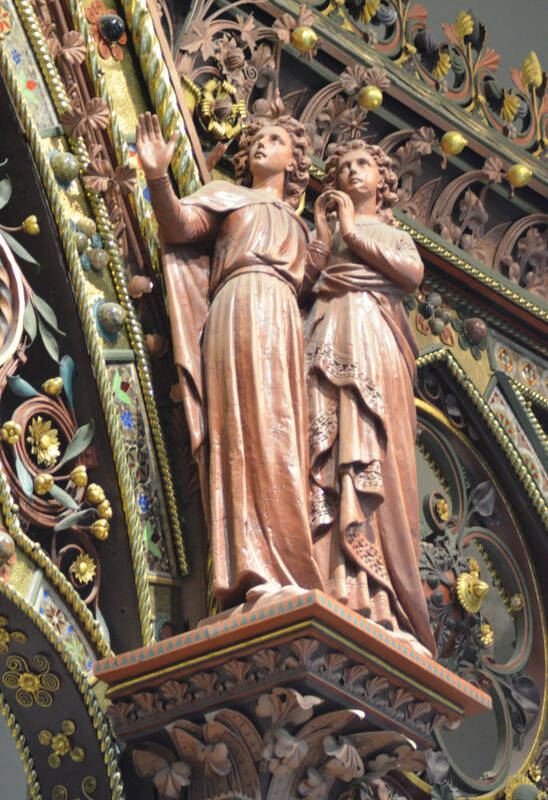 Like the canopy of the Albert Memorial, the Gothic Revival choir screen made for Hereford Cathedral was the work of two great Victorian designers at the height of their powers. 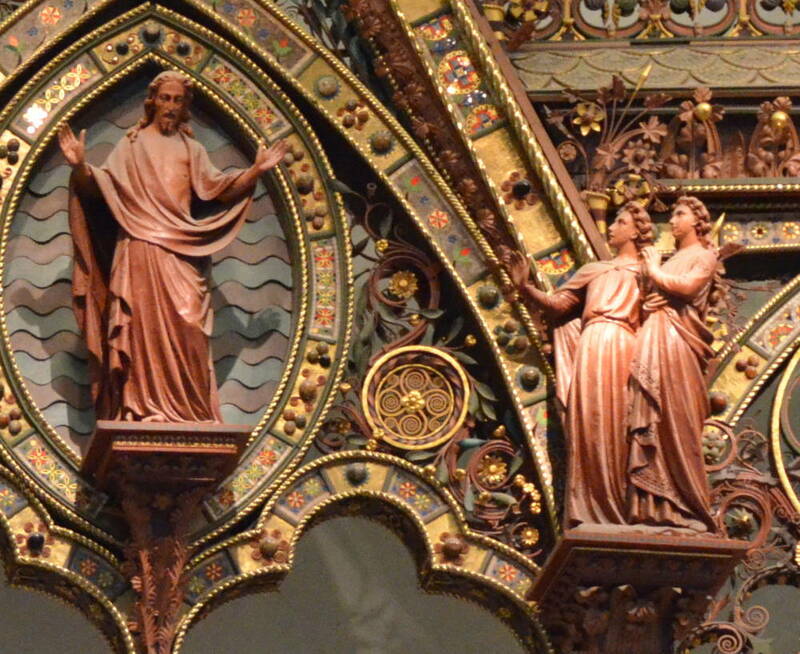 George Gilbert Scott's travels in Europe in the early 1840s had had a huge impact on him. 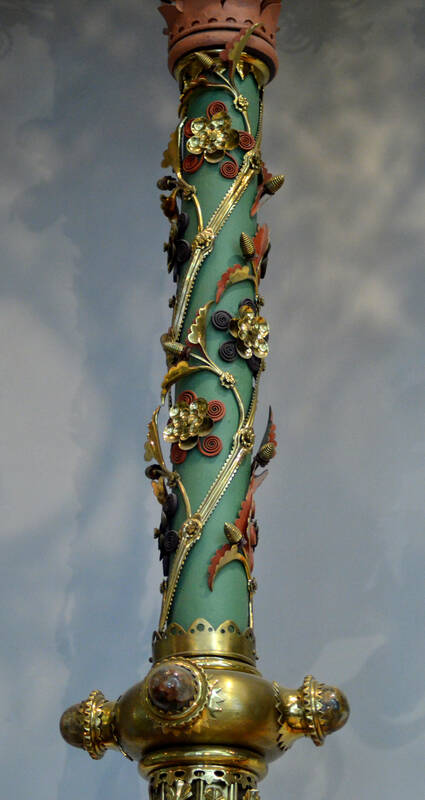 He was inspired by such medieval masterpieces as the soaring Sainte Chapelle in Paris, with its triple-arched screen, and Cologne Cathedral, with its glittering and richly worked reliquary for the Magi, or "Three Kings." Also identified by the V & A as a possible inspiration for the Hereford screen is the elaborate façade of the Duomo in Siena. 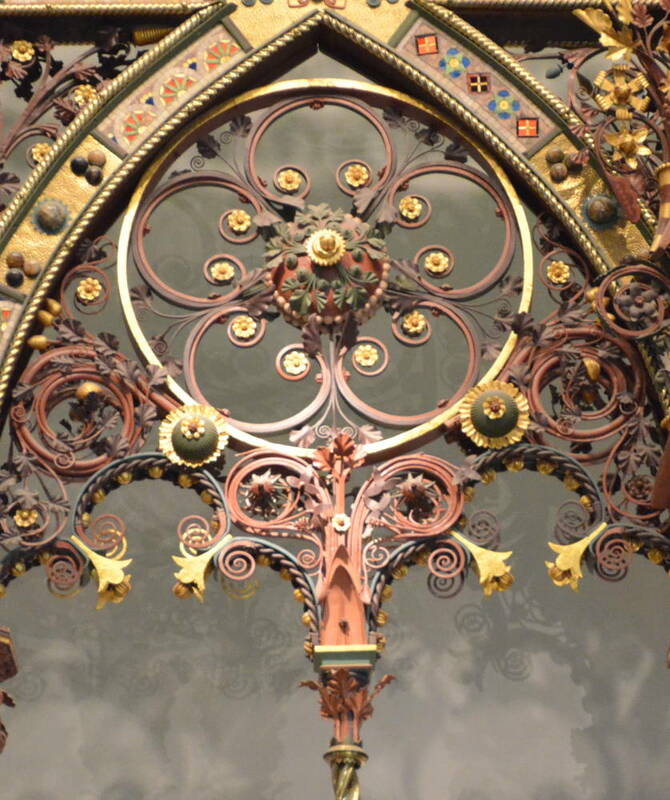 Francis Skidmore (1817-1896), for his part, was probably the greatest of the Victorian metalworkers. 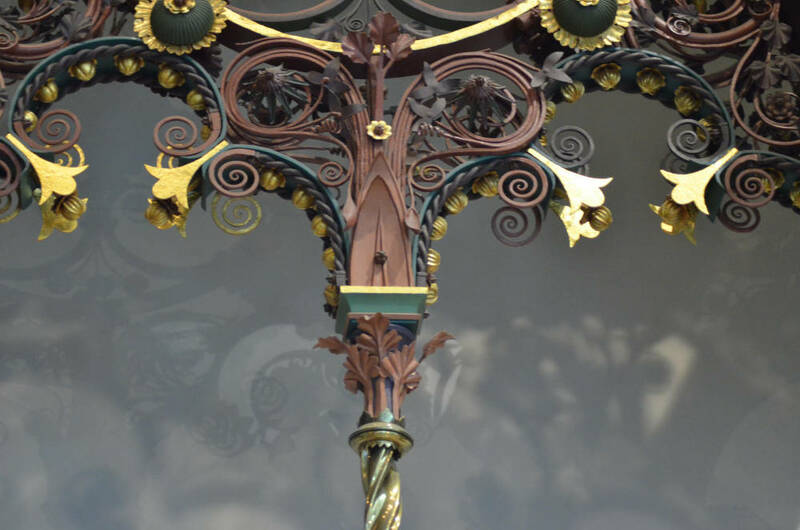 A Coventry craftsman, born in Birmingham as the son of a jeweller, he had learnt metalwork as part of his apprenticeship to his father, and his success in the Great Exhibition had brought him to wider attention. He did a great deal of church work, and his collaborations with Scott at Lichfield and Salisbury Cathedrals as well as Hereford were among his finest achievements. 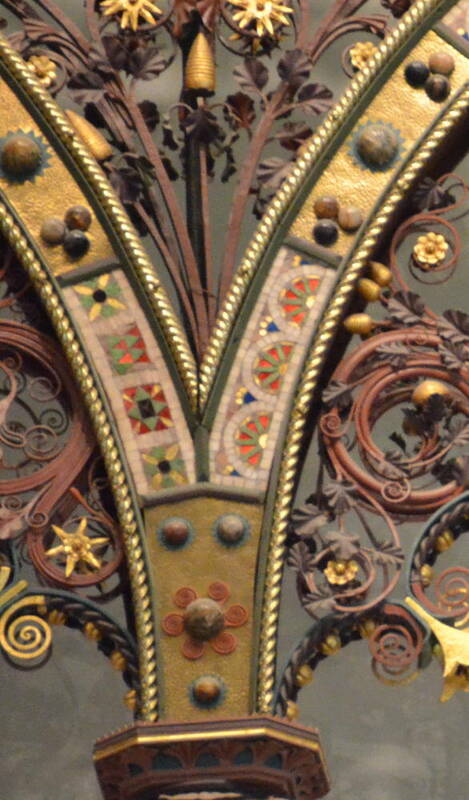 This screen was famous even before it was put in place, because of its appearance at the 1862 exhibition where it won a special medal: the jury called it "one of the most important works, not only for its size, but for the care with which it has been executed," and made the significant comment that it was also one of the most "successful endeavours to treat what is in fact a large architectural subject in metal alone" (medieval choir screens, of course, were made of stone or wood). 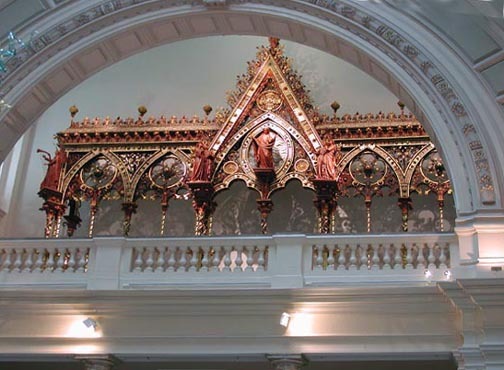 It was hailed in the Illustrated London News as "the grandest most triumphant achievement of modern architectural art" and described as "far the most important and most successful example of modern metalwork" (both quotations from the "Hereford Screen History"). The dismantling of the screen in 1967 shows just how far Victorian church interiors had fallen out of favour by that time. It was finally given to the museum in 1983, and looks very fine in this setting; all the same, it is a little strange to see it out of its intended context. 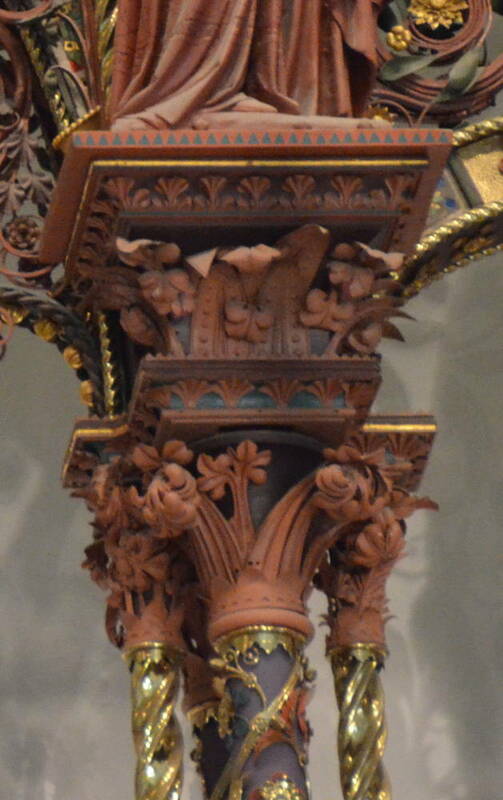 "Francis Skidmore (1817-1896) — A Coventry Craftsman." Web. 21 October 2012. 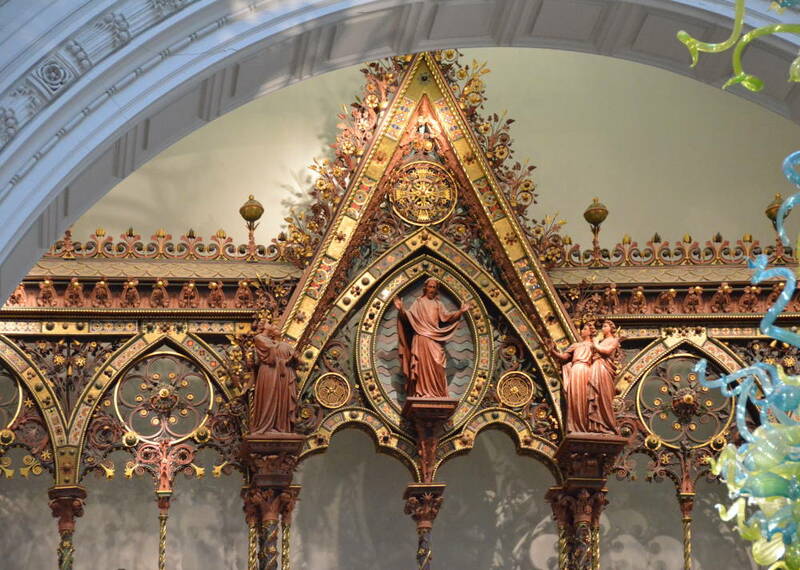 "The Hereford Screen, by Sir George Gilbert Scott, 1862. The Victoria and Albert Museum. Web. 21 October 2012. Information boards at the V & A Museum.